For part 1 of this ongoing series, begin here. The film industry underwent a major shift during the 1940s, one that changed the type of films getting pumped out to the masses and who could create them. As the studio system rose to prominence it crushed most of the independently operated studios across America leaving only a handful outside of the system operating with success. Hollywood became the titan of the sea ruling over the filmmaking business like never before. All other competitors were virtually washed away. Only two African-Americans managed to drift through the 1940s directing their own films, but Spencer Williams and Oscar Micheaux relied heavily on the aid of small white-owned production and distribution companies. The left a single Black studio floating adrift producing its own films for Black audiences and that was William D. Alexander’s Alexander Productions. Through the effort of these men’s creative output and Hollywood’s foray into making all-Black casted pictures, Black women endured lengthy screen time to an extent, but men, more specifically white men, continued to run the filmmaking business. Having previously worked in radio while in Washington D.C. and expanding into journalism through the Office of War Information, Alexander became the only African-American who could afford to keep a studio and produce films of his choice during the 1940s. Though most of his productions were musical shorts, his feature-length films were a mixed bagged of all-Black coupled with interracial creative efforts. Alexander is credited as having made the last “Race film” by a Black producer in 1949 with the socially investigative film Souls of Sin. Meanwhile, director Oscar Micheaux couldn’t compete financially with the films that Hollywood was making forcing him to momentarily leave the business and resort to writing novels. Micheaux returned to filmmaking in 1948 to make The Betrayal with the help of the white-owned Astor Productions. What he hoped would be his magnum opus was instead a box office disaster. The financial loss of the heavily panned film was so severe that Micheax left filmmaking all together to sell his novels for income before passing away two years later in relative obscurity. Gerald Horne notes in his book Class Struggle in Hollywood, 1930-1950 that women of all races working in the International Alliance of Theatrical Stage Employees (IATSE) union suffered during the 1940s. Their work got depreciated to jobs that society assumed women should have: office work, hair styling, costuming, entry-level animation, and make-up. Actors Ossie Davis and Ruby Dee were reportedly shocked at the lack of African-Americans working in Hollywood when they entered the scene in the late 1940s. They recalled from the moment they “entered the gate in the morning till the time we left, we were in an all-white world, and that reality was hard for us to ignore” (Horne, 52). Although their representation and depth of character remained dismal in Hollywood films, African-American female entertainers thrived outside of the boxed-in system of the time period. The Cotton Club in Harlem, among other night clubs, housed phenomenal talent as did the theater groups of New York. Many participants in the entertainment scene of New York would go on to become well-known actresses of the time such as Isabel and Fredi Washington, Dorothy Van Engle, Mae Turner, and Francine Everett. Broadway became a hotbed of activity for Black performances as well. Stage actress Ethel Waters became the highest paid performer before her transition into film. Independent films outside of the studio system gave Black women a visibility that the roles of maids, mammies, tragic mulattoes, and background faces did not provide in a majority of mainstream pictures. Suzette Harbin, Hilda Simms, and Marguerite Margaret Whitten are just some of the many actresses that lit up the screen with starring roles in “Race films” during the 1940s. But, the split personality of Hollywood’s struggle for racial acceptance began to show during the decade. For every step forward Hollywood took, it forced itself back by two more. Lena Horne became the second African-American woman to sign a contract with a major studio. She received massive attention turning heads with her poised, tenderly sweet voice in minute parts of mainstream films and starring roles in Cabin in the Sky and Story Weather, Hollywood’s biggest all-Black films. Though Horne possessed a very light complexion that almost made her indistinguishable from her white co-stars, the construct of race was, and continues to be, so heavily veiled that certain scenes of her films were shot separately so that studios could easily cut them out for Southern audiences. Horne’s role choice was limited due to production code rules in place that forbade miscegenation, sexual relationships between races, once again leaving a human being’s career and future hanging by a string because of race. 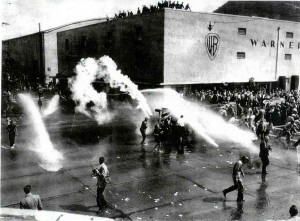 Turbulent times rocked the country throughout the 1940s affecting the film business on a large-scale. World War II was at its height which promoted Hollywood propaganda on behalf of the war effort. Communism became the hot topic on everyone’s lips resulting in the HUAC hearings that blacklisted ten prominent filmmakers and destroyed the careers of many more including famed African-American actors Paul Robeson and Harry Belafonte. By the end of the 1940s, Horne’s name appeared in the Red Channel, a right-wing pamphlet accusing various entertainers in the industry of being communist sympathizers in the age of McCarthyism. Horne’s career didn’t advance too far in Hollywood due to the controversy, though her immense popularity and civil rights activism in later years have contributed to her legacy. Hollywood experienced a bit of an identity crisis during the 1940s. On one hand, Hollywood created three of the biggest films featuring an all-Black cast; The Green Pastures, Stormy Weather, and Cabin in the Sky. Yet, stereotypical portrayals of African-Americans and insensitive ideals based on race still swelled on the surface of these pictures. To this day The Green Pastures is criticized for its stereotypical view of African-Americans. Likewise, Walt Disney produced Songs of the South in 1940, a film that has continued to be shrouded in controversy since its premiere and still has not received a home-video release because of it. The absence of colorful faces in Hollywood during the 1940s fell from immediate thought of most of the whites in charge of jobs and pay in Hollywood. Their focus centered on trade agreements, union battles, and staying safe for the sake of profit. The Conference of Studio Unions (CSU) manifested during this time period in which set decorators among others of the IATSE broke off to join the CSU in hopes of better wages and contract negotiations. When neither happened the workers went on a six-month strike in 1945 before anger turned into a bloody week of rioting, flipped cars, L.A. police teargassing patrons, and a meaty news worthy topic for the public to chew on. By the time the CSU disbanded only a whopping 10 of 9,635 weekly studio employees were African-American. There wasn’t a single African-American secretary, accountant, prop man, grip, reader, cutter, or art director in the motion picture industry (Horne, 52). Nevertheless, Ethel Waters, Horne’s co-star in Cabin in the Sky, enjoyed a fruitful decade that ended with her Oscar nomination for Best Supporting Actress in Elia Kazan’s 1949 film, Pinky making her the second Black woman nominated. Waters and Horne walked tall during the 1940s in spite of the hurdles that stood in their way by systems meant to keep white creators and performers at an advantage. But, it is important that we do not forget the incredible, often forgotten, or blatantly ignored, talents that worked steadily throughout the decade despite their ability to find mainstream popularity. 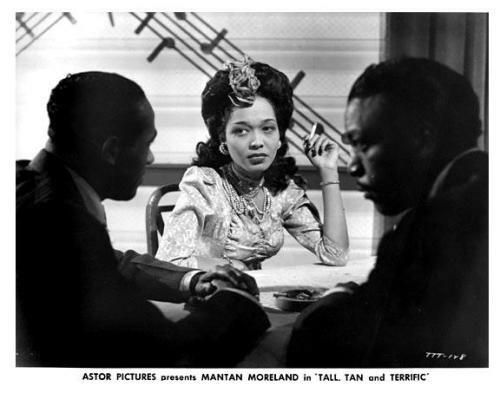 Immediately one can see the stark effects that lacking production values had on the films made outside of the system during the 1940s , but Everett, Van Engle, and Whitten are the few among many talented African-American women who took subpar scripts, amateur filmmaking techniques, and tacky, harsh lighting of the films they starred in and shined an illustrious greatness into them. These women should be remembered for their talents during a time that attempted to shun and silence them. Horne, Gerald. Class Struggle in Hollywood, 1930-1950: Moguls, Mobsters, Stars, Reds, and Trade Unionists. Austin: University of Texas Press, 2001.